Epoxy it and never worry about it again. Wood. You won’t regret it. Ever. Like others seal it, with an epoxy. However, If you want to spend a lot of time there consider another flooring. My knees ache from long hours on concrete. I used Dri-core subfloor panels and just screwed 1/2” plywood on top of them, then added a couple coats of varnish. 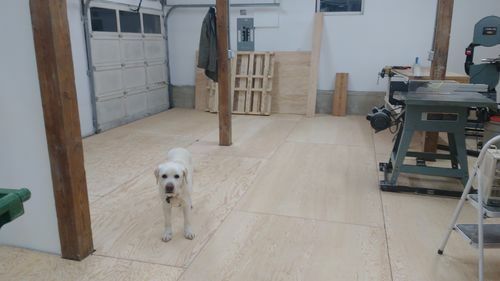 Gives insulation value (warm), built in vapor barrier, soft under foot and the ply gives cheap wood flooring which looks OK for a shop. If a section gets damaged, its cheap and easy to replace.